There was another unpalatable incident of devotees raising objection to some police personnel performing duties wearing shoes on the temple premises. 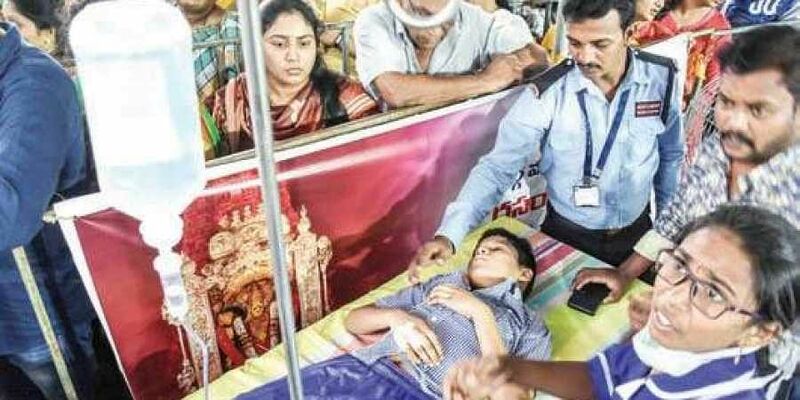 VIJAYAWADA: The first day of the nine-day Dasara celebrations at Durga temple atop Indrakeeladri on Wednesday saw devotees giving vent to their anger against authorities for allowing VIPs to have darshan while they were made to wait in long queues. There was another unpalatable incident of devotees raising an objection to some police personnel performing duties wearing shoes on the temple premises. In the morning, though a specific time slot was allotted for VIP darshan (11 am to 1 pm), some local politicians and others made a beeline to have darshan of Goddess Durga adorned as ‘Swarna Kavachalankruta Durga Devi’ well before their turn. As a result, darshan for the Rs 300 queue line devotees had to be stopped for a while. This made the devotees raise their voice against the temple authorities for according top priority to the VIPs. This did not affect the flow of free darshan devotees. “I have bought Rs 300 ticket to have darshan of the Goddess and it took me two hours to reach the hill shrine from the queue line which began from Lord Vinayaka temple on Canal Road,’’ lamented K Srinivasa Rao, a devotee. The temple authorities split the Rs 300 darshan queue into three lines after reaching the hill shrine causing inconvenience to the devotees. The temple authorities should take proper care to avoid causing inconvenience to devotees visiting the hill shrine from various parts of the State, Rao said. The temple authorities, however, blamed devotees for standing in the queue lines since early morning even though the darshan was allowed from 9 am. In accordance with the tradition, temple priests performed special rituals and devotees were allowed to have darshan of the deity from 9 am. Devotees who had been waiting for hours in the queue lines surged forward when the doors were opened for darshan, chanting Jai Bhavani, Jai Durga Bhavani. Even as the issue came to an end with the temple authorities allowing the devotees to have darshan after the protest, they had to face another embarrassing situation when devotees objected to some police personnel performing duties with their shoes on in front of the Rajagopuram. Officials said police personnel drawn from other areas came to Rajagopuram side wearing shoes out of ignorance. The temple staff swung into action and asked the policemen to take off their footwear. In the evening, an unprecedented devotee rush was witnessed. A devotee who fell ill in the queue was immediately shifted to medical camp where a team of doctors attended to him. Water Resources Minister Devineni Umamaheswara Rao, who trekked to the hill shrine from Vinayaka temple after overseeing the arrangements, joined the common devotees' queue for darshan of the Goddess. Speaking to media, he said VIPs should also go through queue line and avoid causing inconvenience to general public. On the first day, Goddess Kanaka Durga was decorated in Golden Kavacham and the priests offered traditional harathi to the Goddess to mark the beginning of the festival. Temple Executive Officer V Koteswaramma and City Police Commissioner Ch Dwaraka Tirumala Rao had darshan of the Goddess along with their family members. For the first time, Kanipakam Varasiddhi Vinayaka temple offered silk robes to the Goddess. Sri Sivananda Lahari Swamiji of Annapurna Ashram, Arunachalam, along with other dignitaries also had darshan of the Goddess.